On January 31st, simultaneous protests will take place in cities all over the USA to protest the Bush administration's policies. The date was chosen to coincide with the President's state-of-the-union address. I'm always up for a Pacific northwest meetup. I'm in Tacoma and I have car can travel. Mostly I'll need a heads up if it's going to me more than a days worth but other than that I'm good to go. I'll be in San Francisco all next week. I'll be working during the day, but would enjoy meeting folks for dinner. I'm staying downtown at the Hotel Triton on Grant Avenue. What day should I be sick? Friday would be best. I've reserved that day for myself. Thursday I have to drive to Parkfield and back, all for the sake of 5 minutes of video. I sure hope 12 hours worth of driving for a burger's worth of video is worth it. Friday could be tough getting into the city. Let's touch base before then. Since we're posting our trips, I'm going to be in the Bay area (Travis AFB) the last week of Feb or so (haven't set the trip up fully just yet). My plan is to shoot my brains out on the golden gate bridge. Wait that sounds bad. I'm gonna take a lot of pictures. Probably of more than the bridge. Hey so if anyone wants to show me around the non-touristy but super sweet pic areas of SF or wherever, let me know. I'll be out of town that week otherwise, I'd make the trip to Fairfield. Take a look at this first. Screw fairfield, I'll have a rental, I'm going to the big city man! Thanks for the offer though. Maybe another time. The one & only city in the world that i can say that i will def return to. That city is like a car accident...you know you shouldnt look but just cant help yourself. Oh yeah? Well, that happens to be a lovely shot. One of my stereotypes involves Chinese restaurants. I always look to see if a restaurant has Asian customers. "They know better" I tell myself - if they're eating in the place, it must be good. 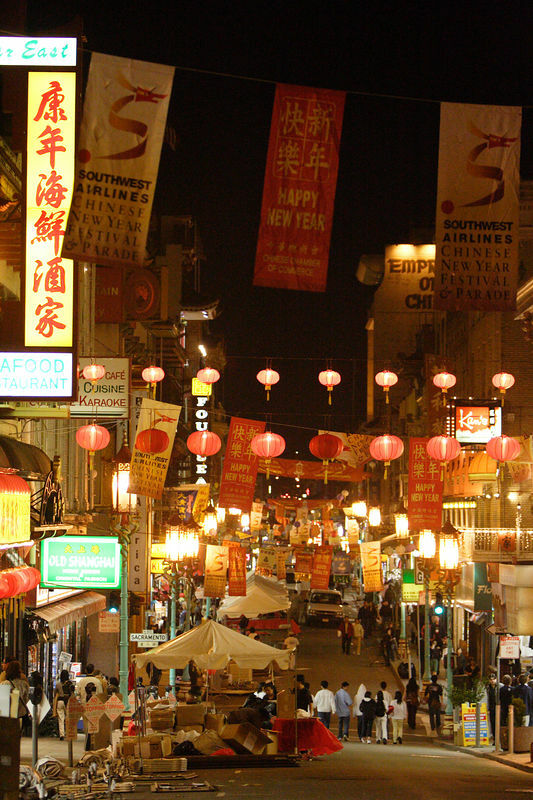 That stereotyping comes to a crashing end in SF's Chinatown. Everybody's Asian! So, either all the danged restaurants are good... or I have to find myself a new measure for Chinese restaurants. By the time I got to town this evening, they were cleaning up after Chinese New Year's celebrations. I have no idea how hard it would be to organize a shoot at Bosque del Apache but I would love to go there next year. Is there anyone else interested in a West Coast Bird Meetup at Bosque this fall/winter? Don't know this place. Please tell us more. Bosque is reportadly one of the top bird photography places in the US. I've never been there so I can't say, but from looking at the images from the place from Arthur Morris and others it looks awesome. I want to go there and patagonia this fall/winter. Most people go to bosque with 500 or 600's + TC's. Right now my longest is a 400 so I will have to find out if big glass is really needed. Ahhh...THAT bosque. I grew up near there. I have to agree..I highly recommend it for any wildlife photo buffs. This Saturday Feb 25 it's coming to Thousand Oaks, next to Amgen, ETA 1 pm. There also gonna be festival, etc. That sounds cool, Nik. Unfortunately I'll have to miss it, as I'll be up in Tehachepi this Saturday. I'd like to see some of your shots though. I'm thinking of going to shoot me some poppies this coming weekend, supposedly Sat April 22d. There was plenty of water recently, and all this week it's gonna be sunny, so I hope to catch them in a peak of blooming. Along the way I also think of visiting to Red Rock Canyon State Park. Nik, I'd love to go, but I have my daughter's track meet all day saturday. Great idea, though! I was just out there two weeks ago, and there are very very few poppies. Don't let me stop you from coming out to have an outing, but I have to agree with the warning...very sparse this year for some reason. Still not a bad excuse to go shooting. I might be able to come and hang out for a while at the reserve. Let me know what time you expect to be out there.